Jason Kreis is back working in MLS, having been named as the new coach of Orlando City SC on Tuesday. The surroundings will no doubt look different from his previous stint with New York City FC. Orlando is a long way from New York in all manner of ways, from geography to the vibe of each city. But when it comes to Kreis' new and old clubs, there are an uncomfortable number of similarities. It leads one to wonder whether he has exchanged one bad situation for another. Both organizations are headed by ambitious owners who want considerable sway over personnel decisions. That in and of itself is no crime. In fact, in many ways it's a positive, so long as their philosophy matches that of the manager they hire. That certainly wasn't the case for Kreis when he was in New York. Owners City Football Group opted for big, splashy signings like David Villa, Andrea Pirlo and Frank Lampard, regardless of whether they happened to fit with what the team needed. Kreis wanted to duplicate the clearly proven blueprint that worked for him when he was in charge of Real Salt Lake. It was that clash of styles, in addition to the less-than-stellar results on the field, that led to Kreis' firing at the conclusion of last season. That's why this seems like such an imperfect marriage. The Lions have spent much of the past nine months thrashing about in a way that goes well beyond the performances on the field. Former GM Paul McDonough did a credible job building the roster for its expansion season, and Orlando came within five points of making the playoffs. Then owner Flavio Augusto da Silva decided to bring in former Benfica executive Armando Carneiro to oversee all things soccer. Since McDonough's authority was fatally undermined, he resigned and popped up at Atlanta United. Then, in a stunning turn of events, Carneiro soon followed McDonough out the door, with founder and minority owner Phil Rawlins taking over the GM duties. Former coach Adrian Heath insisted during the preseason that the crisis had been averted, but the subsequent acquisitions were of the head-scratching variety. Antonio Nocerino was the most egregious example; he's a savvy veteran, but he no longer possesses the mobility needed to be effective in MLS. After an underwhelming single season with New York City FC, Jason Kreis joins Orlando City SC as coach. Of course, when a season goes bad, there is always a question of who bears more of the responsibility: Is it the head coach or the GM? The coach will say, "I did the best I could with what was given me." The GM insists, "I went out and got the players the coach wanted." When the ship is sinking, there is usually just one life jacket to go around between those two individuals, with the GM, typically, having one hand on it already. It seemed a matter of time until Heath was finally cut loose, and while the timing of it was something of a surprise, the outcome wasn't. 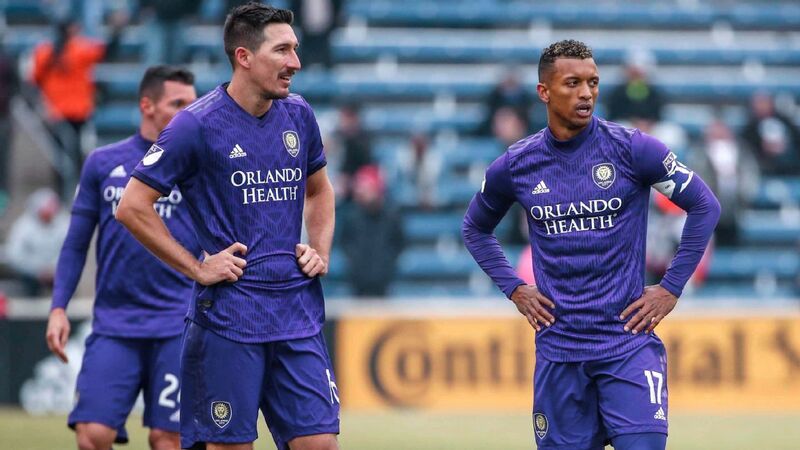 It is into this organizational morass that Kreis is wading, and given the club's penchant for big names like Kaka and Julio Baptista, it's difficult to see how much his situation has changed for the better. Without question, Kreis is a smart coach whose experience in New York will serve him well. It's certain he will have insisted on being given the requisite control that he lacked in his previous head-coaching job. But promises are one thing, reality is another. When a Nocerino is pushed on him, will management listen when he says no? Or will he once again be forced to make do with a roster not of his making? The onus isn't just on Kreis. Orlando's management will need to learn some lessons as well. Would Kreis have been better off waiting for a different opportunity? There are bound to be some positions opening up at the end of the season. Given the struggles that the Seattle Sounders are going through at the moment, it's possible Kreis might have linked up with old boss Garth Lagerwey. But the number of MLS managerial opportunities remain few, and it's impossible to predict when the perfect job will become available. Wait too long, and you run the risk of being forgotten. While Kreis was viewed largely as having been done wrong by New York City FC, his reputation still took a hit. He can't afford to fail again.